Tennis bracelet show with 7 carat princess cut triple AAA quality cubic zirconia and they are mounted over a sleek 925 sterling silver over 18K yellow gold vermeil row. 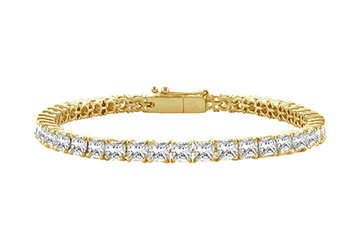 This CZ bracelet produces luxurious charm on any naked wrist. This seven carat CZ tennis bracelet is of 7 inch and a secured safety clasp.